The castle of Thouzon is in fact an old strengthened monastery having belonged to the Benedictines. Perched at the top of a small hill in the da medium the plain of Comtat Venaissin, it preserved of its last radiation only one still arched church, a small vault, two turns, some sections of wall and, in the medium of its court, a cistern dug in the rock. 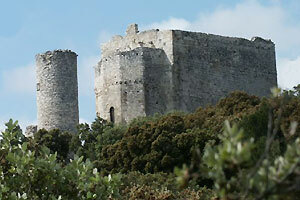 Today private property, the castle of Thouzon is restored and managed by an association affiliated to the union R.E.M.P.ART. which organizes each summer of the building sites of voluntary young people and a medieval festival. Casteland.com particularly thanks Association for the site for Thouzon for the photographs as well as the text.